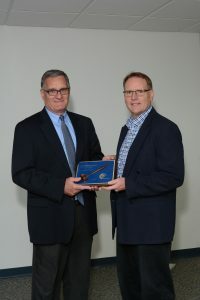 Bill Fromel, outgoing chairman of the Step By Step Board of Directors, was recently recognized for his outstanding service and leadership to the agency. Fromel has served on the board since 2009. In addition to serving as chair, he also served as treasurer and vice chair and participated on several board sub-committees. Pictured from left are Fromel, receiving recognition from George Rable, incoming chairman of the Step By Step Board of Directors.